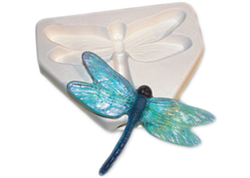 Create an array of the most beautiful glass butterflies with this reusable glass casting mold. Create suncatchers, make a mobile, the possibilites are endless. The fill weight is 115 grams and the dimensions 3" x 4 1/4". Reusable glass casting mold. Create beautiful dragonflies that become even more lifelike when the wings are slumped slightly upwards. Mount the dragonflies on stakes to create sun catchers for the garden. Create suncatchers, make a mobile, the possibilites are endless. The fill weight is 100 grams and the dimensions 4" x 5 1/2".